You know Ainsel, right? Mike Ainsel? Quiet guy, big guy, stays to himself. No? Well, you might know him as another name: Shadow Moon. 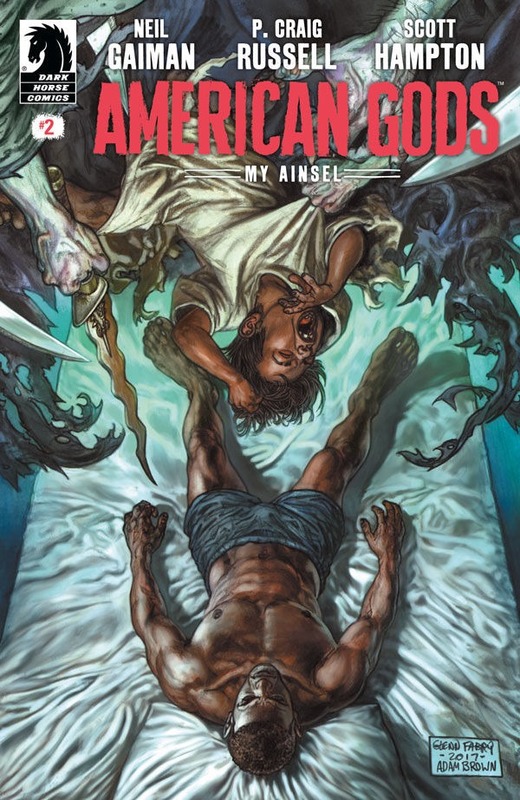 The second issue of Neil Gaiman’s American Gods: My Ainsel rolls on, and Shadow continues his “new life” in Lakeside. Based on the novel by Neil Gaiman, the series is by Gaiman, P. Craig Russell, Scott Hampton, Rick Parker, with a cover by Glenn Fabry. In this issue, we see Shadow getting used to a slow, simpler life than he has had recently. We see Shadow go about the freezing town, meet some of the locals, and realize that life isn’t too bad where he’s at. Not a whole lot of action goes on with this issue, but it doesn’t have to. We delve deeper into the story, and we do so wonderfully. This new series has the story moving towards a major shift, and that shift takes place in the quiet town of Lakeside. American Gods: My Ainsel is the comic book adaptation of the year so far.